This autumn, the ALBERTINA Museum is mounting Austria’s first broad-based presentation of works by Claude Monet (1840–1926) in over 20 years.The 100 paintings to be shown include important loan works from over 40 international museums and private collections such as the Musée d’Orsay in Paris, the Museum of Fine Arts Boston, the National Gallery London, the National Museum of Western Art in Tokyo,and the Pushkin Museum of Fine Arts in Moscow. This retrospective presentation, realized with generous support from the Musée Marmottan Monet in Paris, illuminates Monet’s development from realism to impressionism and onward to a mode of painting in which colors and light gradually separate from the subjects that reflect them, with the motif as such breaking free from the mere observation of nature.As a consequence, the artist’s late works would come to pave the way for abstract expressionism in painting. This rencontre with Claude Monet took place in a high-ceilinged studio filled with light and air, which the painter had built on his property in Giverny to work on his ideas for the so-called Grandes Décorations, which he later donated to the French state. What Gimpel saw were smaller, easily movable canvases, which were preliminary works for this endeavor. Monet, who originally planned a circular installation of his water lily pond paintings in the Hotel Biron in Paris,had arranged them accordingly. His plan was abandoned after 1920, however, in favor of a realization in two oval rooms of the Orangerie. 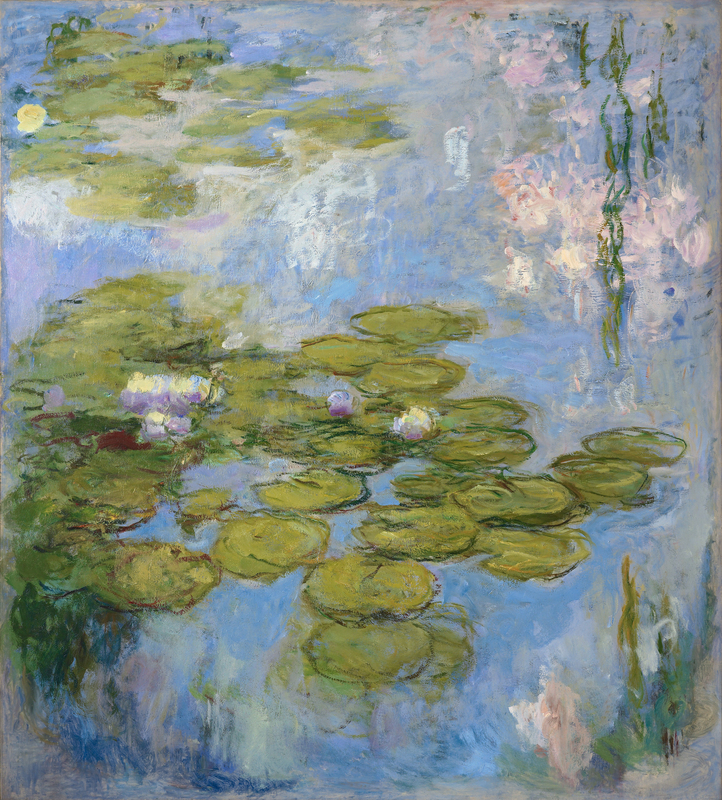 The painting from the Batliner Collection in the ALBERTINA Museum, The Water-Lily Pond, is one of these preparatory works, some of which were sold during Monet’s lifetime. 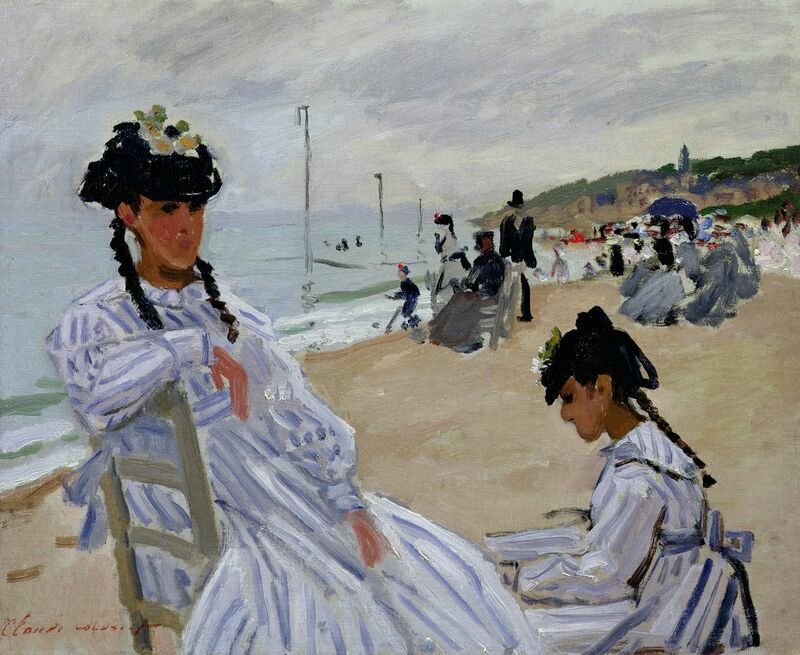 It is therefore fortunate that the ALBERTINA Museum has found a partner in the Musée Marmottan Monet, which has provided forty of its most splendid paintings by Monet for this exhibition. 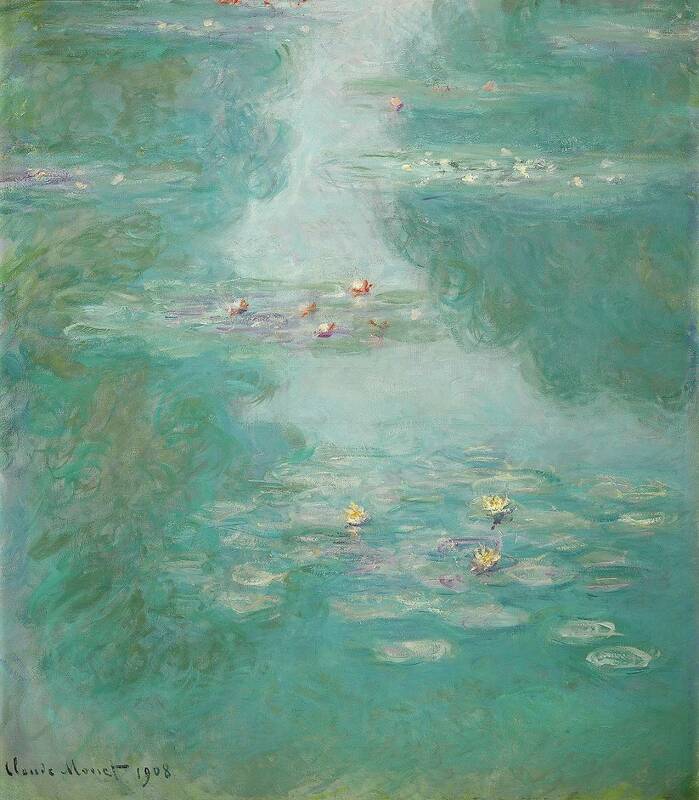 For a short time, the ALBERTINA Museum’s Water-Lily Pond finds itself in the midst of those paintings, in the context of which it was created at the time. With two other works from the Batliner Collection, which Monet painted inVétheuil and Giverny, as well as over fifty paintings on loan from about forty international institutions and works from private collections, the exhibition traces the life and work of Claude Monet with paintings that are both lavish and colorful, and yet at times also astonishingly chromatically reserved. The motif for this exhibition’s poster is the monumental work On the Boat, which Monet painted on the water in 1887; it is being shown courtesy of the National Museum of Western Art in Tokyo. As with the nature in Monet’s landscapes, this street is a place of constant activity that changes according to the time of day, the atmosphere, and the weather. Among the impressive loan works, many of which are in large formats, there is also the Grainstack in Sunlight (1891, on loan from Kunsthaus Zürich), which Kandinsky saw in an exhibition on French impressionism and greatly admired. Despite his enthusiasm, however, Kandinsky had difficulty recognizing the motif—an effect that presaged Monet’s emancipation of colors and the advent of abstract painting. The Cleveland Museum of Art, Estate of Leonard C. Hanna, Jr.
Further highlights are Monet’s early winter paintings, including the portrait The Red Kerchief (1873, Cleveland Museum of Art, Ohio, USA); two paintings of Rouen Cathedral from an extensive series that he created before this Gothic national monument that would themselves become icons of impressionism; and several paintings of the river Creuse in the Massif Central region done in very nasty weather that are pioneering in terms of their composition and use of color. and his The House Among the Roses. Water as a source of inspiration“A Floating World” is the evocative subtitle of the exhibition in the ALBERTINA Museum, the artist’s first large-scale retrospective in Vienna in more than twenty years. 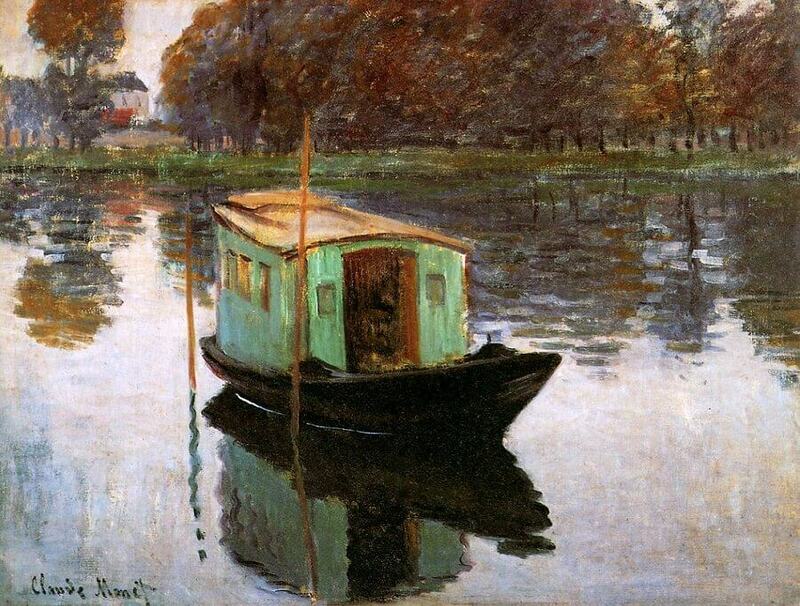 The Seine was a home to the pleinairist—both in terms of his various residences and his studio boat, from which he sought to capture the nature and life of the river and its shores with his paintbrush, regardless of the weather conditions. Guided by one hundred paintings, the exhibition visitor follows in the footsteps of the most important Impressionist along the Seine, pausing at various stations of his life: in Paris, where Monet captured the pulse of modern life with flickering light; in Argenteuil, where he reconciled nature and technology; in Vétheuil, where, in the face of his precarious financial and family situation, he withdrew into solitude to devote himself to unspoiled and original nature; and finally in Giverny, where he arrived at a new aesthetic concept that led Impressionism out of its crisis and paved the way for modern painting. The river also stands for the many aspects that characterize Monet’s oeuvre: the flowing world of the Japanese woodblock prints that influenced Monet; the coalescing of water, mist, fog, snow, and ice; the colors that change with the weather and lighting conditions; the reflections on the water surface. The visitor also accompanies Monet to the coasts of Normandy and Brittany, to London and Norway, either to understand his beginnings in Le Havre and his repeated visits to the Atlantic coast, or to visit places together with the artist which promised him new inspiration for his painting. 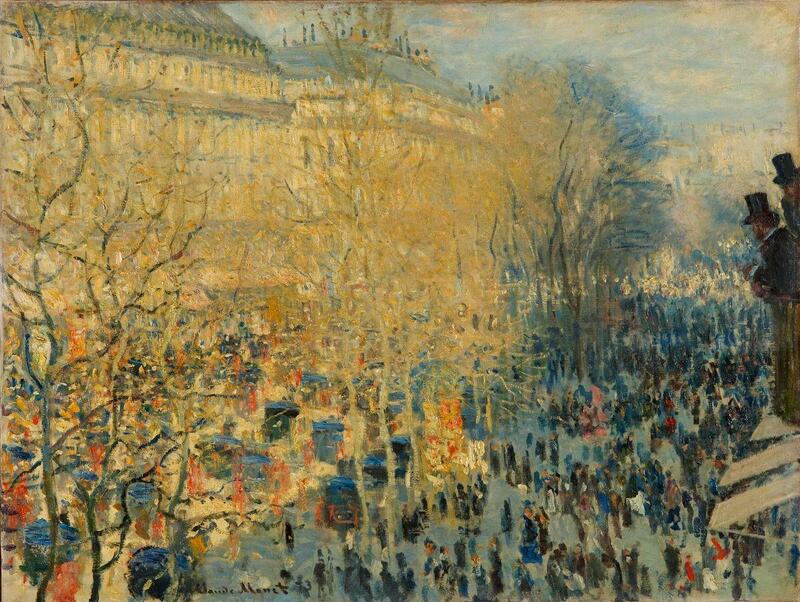 Claude Monet was fifty years old when he finally had his first successes. Yet for his friends he had always been the uncontested leader of “Impressionism,” the movement that self-confidently staged its secession from the official Salon under its derisive nickname. Even before the outbreak of World War I, Monet would become a living legend celebrated as a giant.Monet’s enduring popularity is due to the fact that his painting can be considered the last generally comprehensible form of expression in the visual arts. Given its apparent self-evidence, it is easily overlooked how it changed the visual habits of generations. Bringing light to the canvas, Monet radically rejected academic painting: his random views, sketchy brushwork, and depictions of fleeting moments contradicted the idea of an accomplished and finished painting. 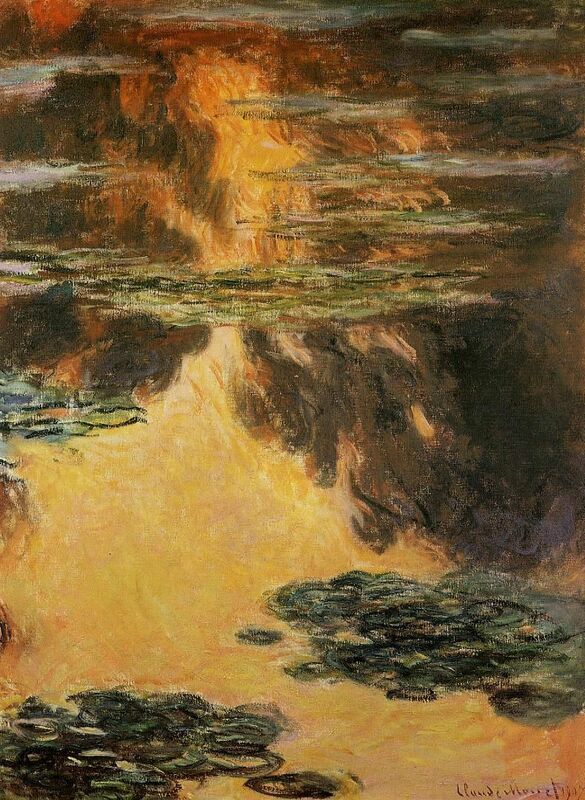 Monet did not find his motifs in the past, but in the immediate present. A witness of his time, he captured the hustle and bustle of modern boulevards and the humble charm of Parisian suburbs, with their smokestacks, bridges, and leisurely Sundays on the banks of the Seine. The greatest plein-air painter of all time committed the changing light to canvas outdoors instead ofthe confinement of his studio.In this retrospective, a hundred paintings trace Monet’s development: from his beginnings in Paris to his stay in Argenteuil and the years in bitter poverty in Vétheuil, where he painted some of the most superb winter and spring landscapes. This was followed by a period of triumph, the series of the 1890s: the haystacks, Rouen Cathedral, and the Creuse landscapes as the first series Monet painted from a single viewpoint in changing light conditions. For the last thirty years of his life, Monet directed his gaze from close up at the opulent nature of his garden in Giverny: the water lily pond, the Japanese bridge, and the alley of roses. As the Franco-Prussian War of 1870/71 marks a turning point—the transitionfrom monarchy to Third Republic—in French history, these years also led to profound changes in Monet’s personal life: before the outbreak of the war, he married Camille, his companion of many years and mother of his son; seeking to escape military service, the painter fled to London with his young family, where he was inspired by the art of James Abbott McNeill Whistler and John Constable and the late work of William Turner. In London, Monet met Paul Durand-Ruel, his most important art dealer and supporter for many decades to come. 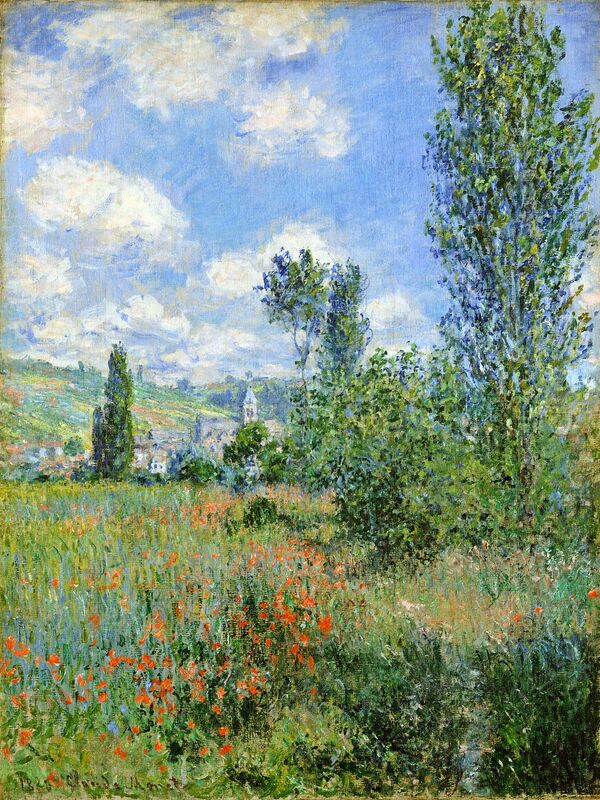 In those years, Monet received the inheritance from his recently deceased father and from his wealthy aunt, which ensured his independence. After his return from London, Monet also met the department store magnate Ernest Hoschedé, an influential patron. Monet settled in Argenteuil, a few kilometers outside Paris, where he continued to have a studio.During this period Monet became a keen observer of the shift from the metropolis to the countryside, the changes brought about by industrialization, and railroad traffic and its infrastructure of stations and bridges. Monet’s pictures of those years show boats on the Seine; a steam engine pulling into the station in deep winter;a fragile bridge construction the artist painted from his studio boat (his own design) in the middle of the Seine; pictures of winter in which he has captured the different temperatures—from biting cold to thaw—in the subtlest nuances. In Argenteuil Monet also adopted the achievement of a flat pictorial layout from the Japanese woodblock prints that were traded on the Paris art market in large quantities. In 1871 Monet returned to France from his London exile via Holland and settled in Argenteuil. Whether it was the Zaan in Holland or the Seine in France: the river increasingly became the focus of his attention. Situated on the Seine not far from Paris, Argenteuil was surrounded by asparagus fields and vineyards; industrial plants alternated with embankment promenades; both a railroad bridge and a road bridge crossed the river. The water reflected the smoke of factory chimneys fuming in the distance, the bridges, and a boat hire. In Monet’s pictures, the strokes describing this mirror image began to develop a life of their own, partly detaching themselves from the concrete motif; the blurring reflections permitted Monet to carry his sketch-like manner of painting further. Moreover, Monet’s garden became increasingly important for him. When moving again in the future, he would always insist on having a garden. Whereas in Argenteuil his garden still existed independently of his painting, Monet would later lay out his garden in Giverny with his painting in mind, subordinating the design of the garden to his art. 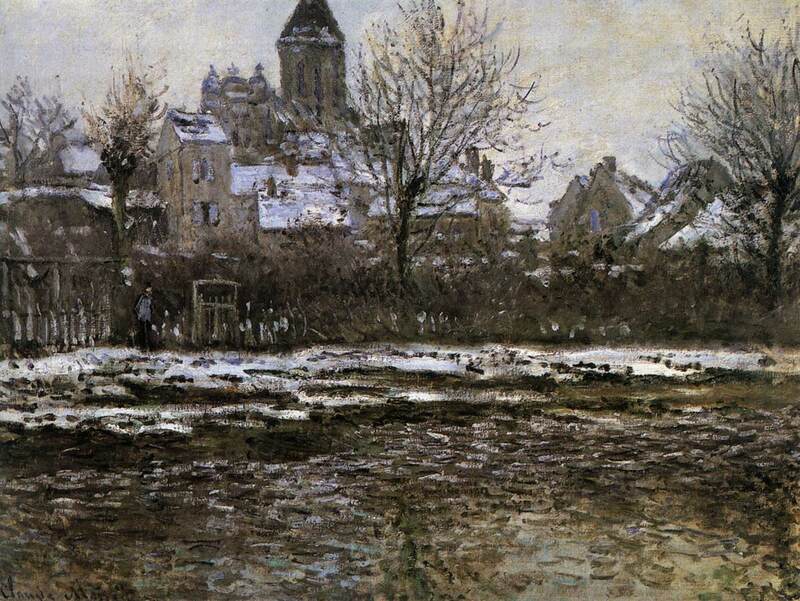 In January 1878 Monet was forced to leave Argenteuil because of a heavy burden of debt. He had to exchange the Parisian suburb, which could easily be reached by train, for the remote village of Vétheuil. As Monet’s patron Ernest Hoschedé had gone bankrupt with his business, he could no longer support the artist, who was still eyed with suspicion because of his renewal of landscape painting. 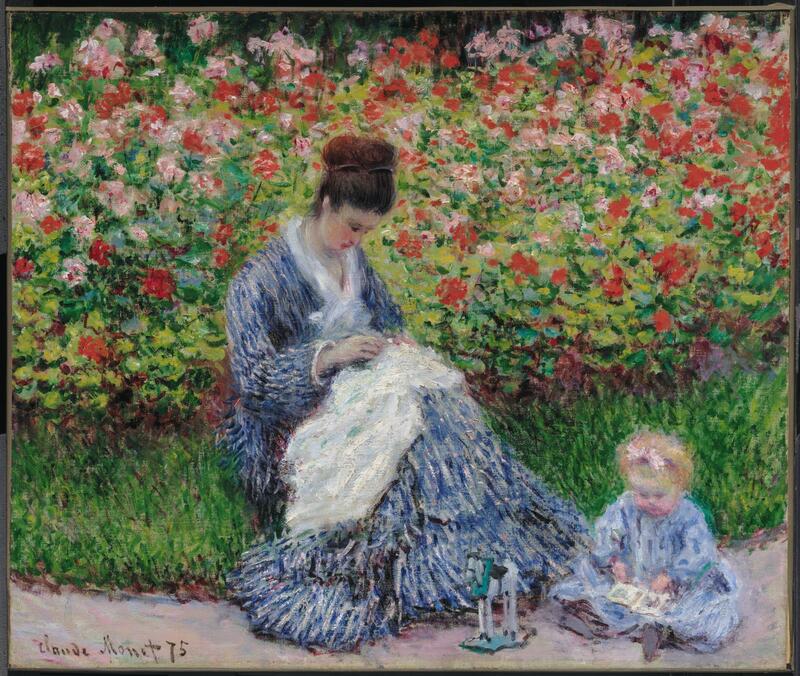 In March, Monet’s wife Camille gave birth to their second son. Alice, Ernest Hoschedé’s wife, did not follow her ruined husband to Paris, but moved to Vétheuil with her six children, where they shared a house with the Monets. Camille, who was seriously ill, died the following year. The pictures of the snow-covered Vétheuil and the disastrous ice break of the winter of 1878/79 emanate the deep melancholy and sadness of a life marked by failure and personal misery. Only the spring and summer pictures Monet painted in Vétheuil during those years of great poverty do not betray the unlucky personal fate of the painter, whom his friends already regarded as the Impressionists’ uncontested leader. Monet was too much of an eye for the oppressing situation to obscure his unerring vision of nature. In 1883 Claude Monet rented a house in Giverny and moved there with Alice Hoschedé and their eight children. Following a period of extensive travels and his first major successes with his series of the Creuse and Rouen Cathedral, the artist was finally able to purchase the small house, a former cider press, in 1890. After Ernest Hoschedé’s death in March 1891, Monet and Alice married the subsequent year. In the 1880s, Monet extended his travels to the whole of France, painting the spectacular coasts of Normandy, the Mediterranean, and Brittany. If Monet had hitherto avoided using famous landmarks as pictorial motifs, in Étretat he began to paint one of the most stunning natural monuments in France: the solitary rock needle and rock gate of Aval, which Jean-Baptiste Camille Corot and Gustave Courbet had immortalized before him. As in Vétheuil and Argenteuil, Monet was interested in the changing appearance of his motifs, caused by different weather conditions, the times of day, and the seasons. He studied the stages of the sunset, with the distant coast increasingly curling into a dark block set against the light. With loose brushstrokes he sought to arrest the individual moment that was so difficult to grasp aesthetically. 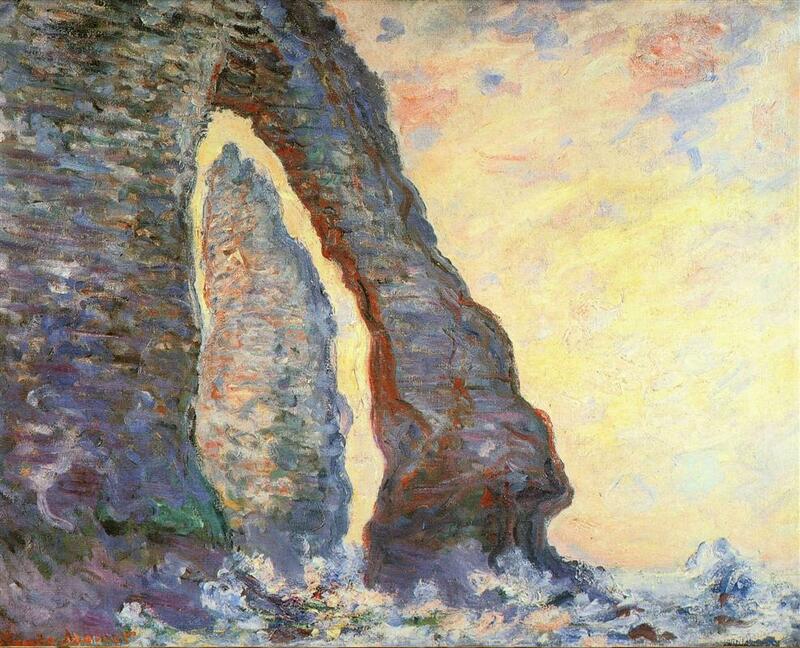 Whereas in the following decade Monet would approach the motifs of his famous series—the façade of Rouen Cathedral, the grainstacks, the Houses of Parliament in London, and the hills above the Creuse—from a single perspective and observe how they perpetually changed in the light and atmosphere, on the Normandy coast he still studied his motifs from different viewpoints, both from the distance and from close up. Monet still orbited around his motif, paintingit from various perspectives. The green tone of deep water, the purple glow of wet sand, the dance of thousands of lights as the sun slowly sinks into the sea—nothing escaped Monet’s eye. It also observed how the bright morning light softens the contrasts between colors and bathes the coast in an even light.While working on the French coast, Monet, resorting to the concepts of sprezzatura and non-finito, gave the swiftly painted sketch an autonomy of its own, so that the line between sketch and finished painting became increasingly blurred. Monet’s art dealer Durand-Ruel disliked overly sketchy paintings, which he considered unsalable. On the other hand, the artist protested that the paintings he delivered were finished all the same.The scandal about Impressionism was closely linked to the reproach of producing unfinished work. Although the oil sketch as an independent art discipline has long found its devotees, in the case of Monet the scandal had to do with his claim that what resembled a preliminary sketchiness actually represented the final work of art. For Monet, the swiftness of painting was in fact proof of the truthfulness with which a momentary mood and atmosphere were captured with due spontaneity and immediacy. In 1889 Monet traveled to Fresselines for the first time in the company of friends. Located on the plateau above the confluence of the headwaters of the Creuse, the commune was enclosed by a gloomy and melancholy landscape. Here it was for the first time that Monet did not paint a series of pictures representing a sequence of various views of the same place: he gave up the depiction of a single motif viewed from different spatial perspectives in favor of the depiction of the same motif viewed at different times. This and the subsequent series—of poplars, grain stacks, and Rouen Cathedral—are almost necessarily deserted: the observation of a motif at different times required steady surroundings. In these pictures the lapse of time and change are brought about without the painter moving back and forth while the light and the colors alter. Monet painted the Valley of the Creuse in the morning, at noon, in damp and cold weather, in bright sunlight, and at dusk. 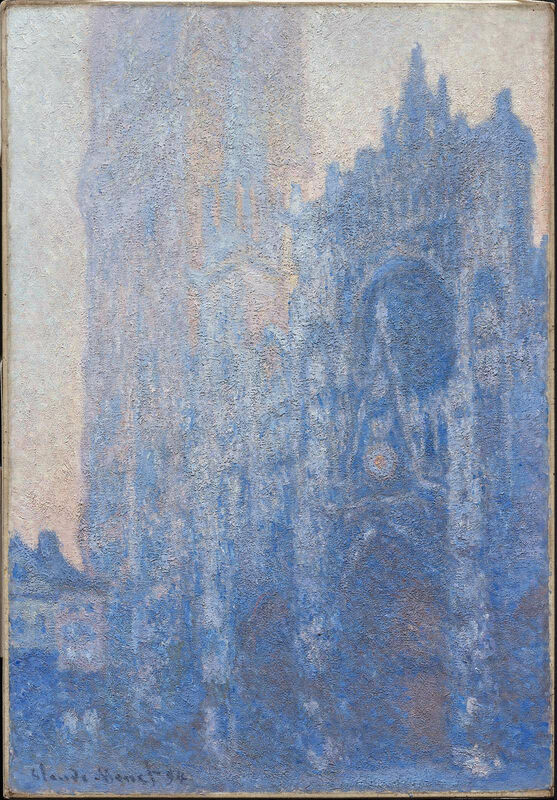 The differences in the landscape—and later in the façade of Rouen Cathedral—manifested themselves in ever-smaller time units, so that Monet frequently worked at three to four canvases simultaneously in order to be able to respond to changes in the position of the sun and in the atmosphere. In 1883, Monet moved to Giverny, a small town on the Seine 70 kilometers west of Paris. He rented an old cider press and orchard, where he lived with his companion Alice and the children. Crowned by long-overdue success, the artist was finally able to purchase the estate in 1890. Here he completed two gigantic panoramas of the gardens of Giverny, which were already a great attraction during his lifetime: the legendary Grandes Décorations, which he would eventually donate to the French state after the end of World War I. It appears that neither political events, such as the corruption scandal accompanying the construction of the Panama Canal (1892) or the state crisis triggered by the Dreyfus affair (from 1894 onward), nor personal blows of fate left any traces in Monet’s art: around the turn of the century, Monet’s stepdaughter, his second wife Alice, and his son Jean died within a few years. As if Monet were only working for himself, he devoted himself to the blaze of color in his private refuge with astonishing exclusiveness. Whereas the young painter had roamed the countryside in all kinds of weather to render his motifs from different perspectives, in the 1890s Monet, now in his fifties, painted his famous series: variations of a motif he depicted from a single viewpoint and under changing conditions of light and weather. In his old age at Giverny, Monet finally devoted himself exclusively to his opulent flower garden and the alley of roses, the exotic willows, the Japanese bridge, the wisterias, and the water lily pond. In his late work, which was revolutionary in terms of theme, composition, and painting technique, Monet was solely guided by his inner sensations—an approach helped by his diminishing eyesight due to a cataract. The interpretation of the alley of roses and the Japanese bridge as a tunnel from which there was no escape expressed the more-than-eighty-year-old painter’s wish to completely withdraw from the outside world, his melancholy reading of nature reflecting a life drawing to a close. Nevertheless, Monet’s dark epilogue gave another fresh turn to his painting, whose radical modernism would only bear fruit decades after the death of this great master of plein-air painting. Claude Monet is born in Paris in 1840. He spends his youth in Le Havre. After two years he is exempted from a seven-year period of military service in Algeria through payment for a substitute. Monet receives allowances from his family until his father’s death in 1871. During his studies in Parisian studios he meets his future friends Pierre-Auguste Renoir, Alfred Sisley, and Frédéric Bazille. In 1867 Camille Doncieux, Monet’s lover and model, gives birth to their son Jean. The couple marries in 1870. In order to escape army service during the Franco-Prussian War, Monet flees to London in 1870. He is fascinated by the haze, smoke, and fog in the city on the Thames and studies the art of John Constable and William Turner. In 1871 he returns to France via the Netherlands and for a period of seven years settles in Argenteuil, a Parisian suburb on the Seine: Argenteuil becomes the cradle of Impressionism, and Monet is regarded as the “Impressionists’” uncrowned leader. The painter and his friends receive this derisive nickname in 1874 on the occasion of their first group exhibition because of the sketchiness of their atmospheric manner of painting. In 1878 Monet is forced to leave Argenteuil for Vétheuil, a remote village on the Seine, because of a huge burden of debt. That same year Camille gives birth to their second son, Michel. She dies in 1879 after a serious illness. After her husband has gone bankrupt, Alice Hoschedé, the wife of Monet’s former patron, and her six children move in with Monet. It is only after the death of Alice’s husband that she and Monet legalize their relationship through marriage in 1892. In this difficult phase of his life, the artist paints not only melancholy pictures of the snow-covered Vétheuil and the disastrous ice breakup of 1880, but also sunny spring landscapes. Having accumulated more and more debts, Monet also has to leave Vétheuil. In 1883 he rents a small cider press in Giverny, which he is able to purchase in 1890. In the 1890s Monet paints his famous series, which finally earn him success and fame: the Creuse landscapes, the haystacks, and Rouen cathedral. However, his real passion lies in painting his garden in Giverny, which he gradually enlarges. These pictures reveal nothing of the painter’s personal blows of fate: the deaths of his stepdaughter in 1899, his second wife in 1911, and his first son in 1914. Neither does Monet’s withdrawn late work reflect the French state’s serious crises, not even World War I. The artist has long been considered a living legend and one of France’s national monuments. With his vision heavily impaired through a cataract, Monet bathes his pictures in the colors of late autumn during his final years. 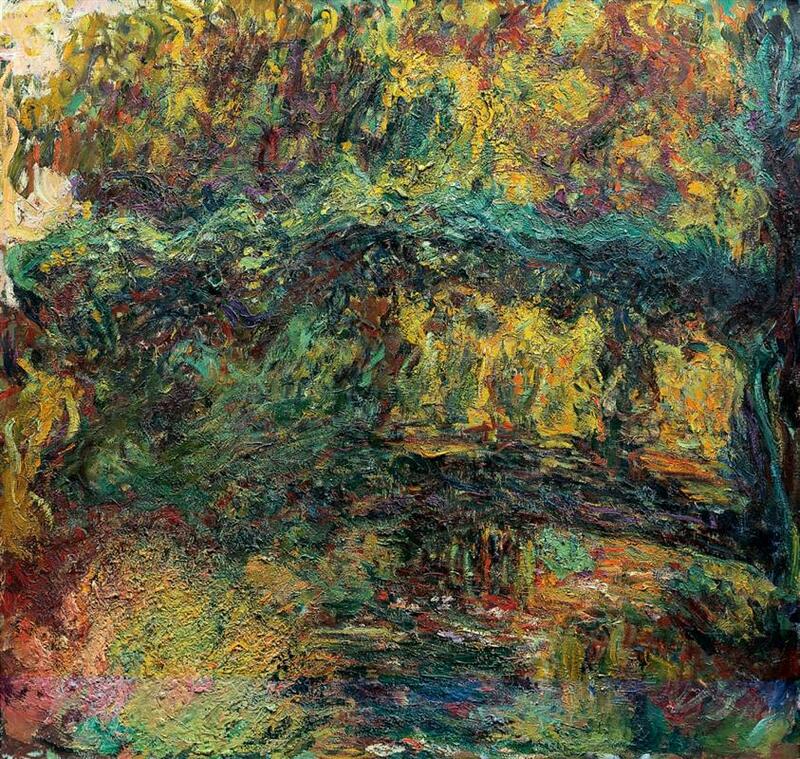 These gloomy and almost abstract paintings only become known after Monet’s death in 1926.